The reference here, of course, is to John Constable’s most famous painting “The Hay Wain“, painted in 1821. Just in case some of you don’t have one parked in the garage, a hay wain is a large farm cart. The Gustave Courbet painting “Good Morning, Monsieur Courbet” (sometimes called “The Meeting”) depicts a chance meeting of Courbet with his patron Alfred Bruyas and Bruyas’s servant Calas, on a road outside Montpellier. It was painted in 1854. I have taken liberties with both place and time to have these two yakking away in the same studio – but not too many. I kind of set myself a loose believability range when I show unlikely meetings between artists. Even though Constable died in 1837, their lifetimes overlapped – Courbet was born in 1819. This rule of overlapping lifetimes is most noticeable in my David Hockney photo album cartoons. It just starts feeling a bit silly and flaccid to me if I don’t. Speaking of Hockney, I actually met him once. I was working for an art dealer many years ago when he dropped in. As the dealer and Hockney were old friends, I was introduced. 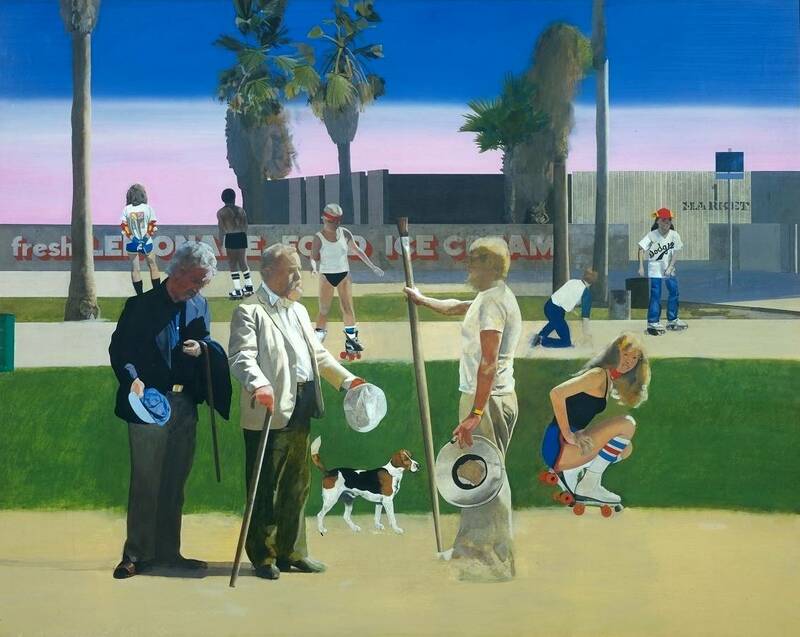 “Good morning Mr Hockney”, and as we shook hands I blurted “This is just like a Peter Blake painting!” Hockney laughed, my employer looked puzzled, as you probably do now too. That’s because you didn’t realise that Peter Blake painted a homage to the Courbet painting, called “Have a Nice Day, Mr Hockney” did you? Ok, maybe you did, but you’ll have to forgive me for being a bit paranoid about missed references. 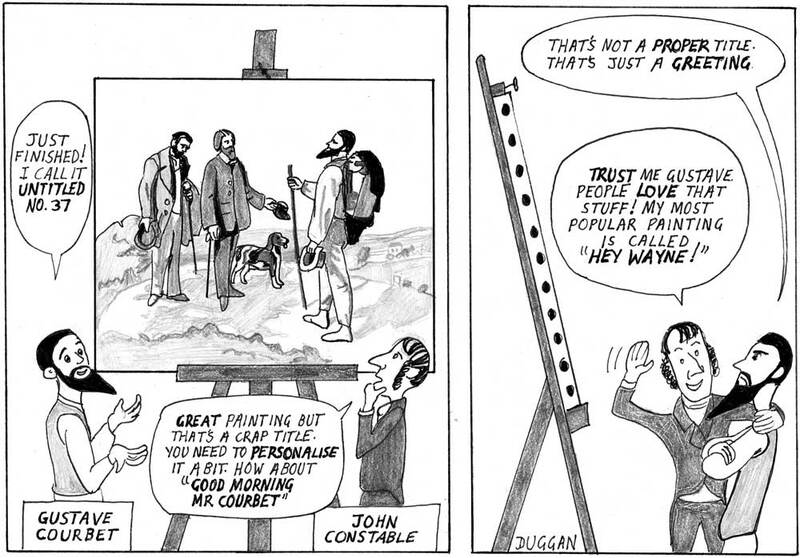 I copped a bit of internet flak once over a cartoon with Peter Blake in it, along the lines of “Unfunny!” and “What’s the point of this?” (Peter Blake is most famous for creating the cover for Sgt. Pepper’s Lonely Hearts Club Band). I didn’t think the cartoon was that bad, and as it also got some rave comments I was a bit puzzled. Until, that is, I discovered that all the 20-somethings I worked with had never heard, or even heard of, the song Give Peace A Chance by John Lennon and Yoko Ono, which meant missing the funniest bit of the cartoon. A generation gap had opened up and no-one told me. Sorry, I really should have saved this Blake stuff for a different blogpost but you know how one thing leads to another.